In all the bluster about the executive presidency and the 10% threshold, it can be easy to forget that this election is fundamentally about who the Turkish electorate trusts to become its next government. Most seasoned followers of Turkish politics know the well-rehearsed argument for the AK Party’s success: living standards went up, government services improved and more people found work, and the electorate rewarded them handsomely for it. But the signs are mounting that consumers are increasingly left out of pocket where it hurts – food prices is one such place. 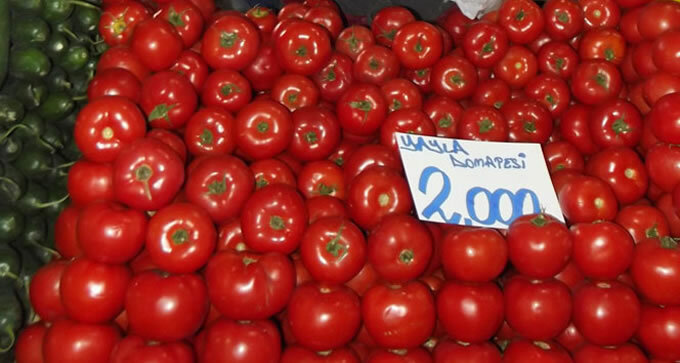 Tomato prices, for example, are fluctuating all over the place because of a national shortage this year. 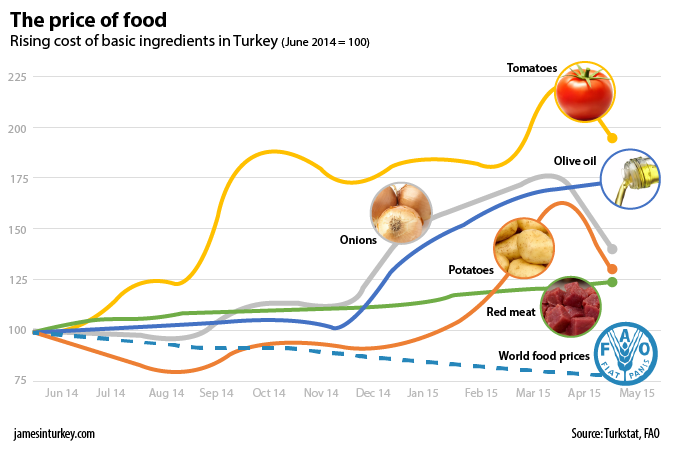 Potatoes are phenomenally expensive, sold for 5 TL ($1.87; €1.68) per kilo in some parts of eastern Turkey. That’s nearly 10 times the price just across the border in Georgia, a price difference that residents take advantage of. Then there’s the cost of meat. The Turkish Statistical Institute finds beef costs 34.28 TL on average – a rise of nearly 25% in twelve months – in part because Turkish farms are not well-adapted to bovine farming. The striking aspect of this scenario is that the trend is in stark contrast to world food prices (dotted line), which have been falling rapidly over the same period. There is no doubt that Turkish living standards have massively improved since the AK Party came to power in 2002 – but people are beginning to feel the squeeze again. Will this result in the AK Party being decisively kicked out of office? No, but it is one of a growing list of reasons why many ordinary people will switch their vote this weekend.